I hope you are all having a blessed Holy Week! As you may have noticed, I’m making my post a little earlier than normal, before the rush of the Triduum begins. I’ll tell you all about that in my next post, but for now let me tell you what’s been happening this week. 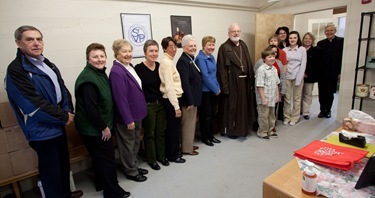 I met with the new leadership of the Sisters of the Holy Union last Wednesday. I was meant to meet with the new superior of the Daughters of St. Paul at the same time, but unfortunately, she was sick and was unable to come. They talked about how one of the sisters had just come back from Cameroon. We spoke of the Pope’s visit to Cameroon, where they have many sisters working. 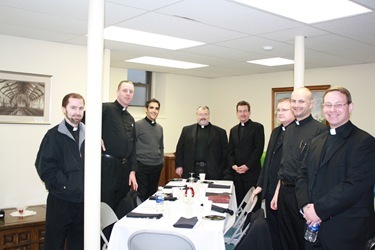 That evening, I went to St. John’s in Quincy where I met with about 20 of our recently ordained priests. We had a Holy Hour, prayed vespers, ate dinner and then we had a discussion. 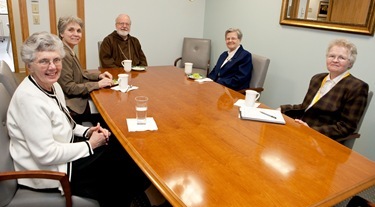 I asked them for their ideas and recommendations on how we might best respond to the Holy Father’s invitation to celebrate the upcoming Year of the Priest. A lot of ideas about that came up. 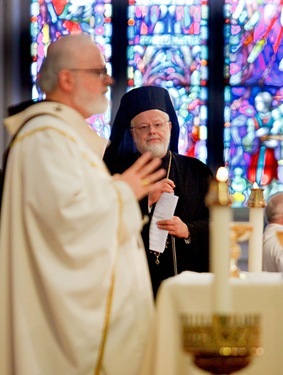 We were also encouraging them to consider the possibility of coming to Ars, France, for the international priests’ retreat that is being organized by the Congregation of the Clergy. 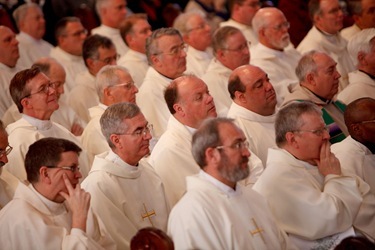 Father Bill Kelly has been doing a great job promoting the retreat and encouraging our priests to attend. I’d also like to mention the very nice renovations they have made at St. John’s. 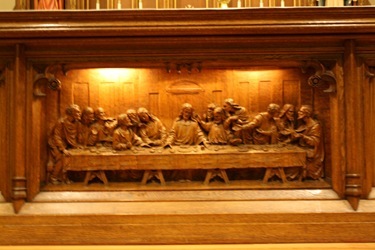 Here is a beautiful shot of the Last Supper by the altar. On Thursday, Mr. Carlos Escobedo, Consul General of Guatemala for New England, and his wife paid me a visit in my office at the Pastoral Center. During our visit we spoke about the plight of many of the Guatemalan immigrants who are here. Many of them are without papers, and there are some who have been detained. He has been very active in advocating for them. 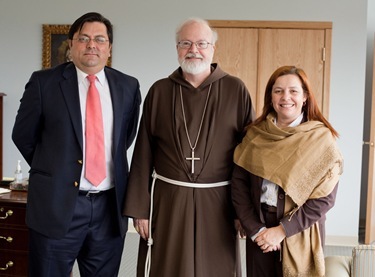 In the past he has visited some of our parishes that have large Guatemalan populations to make them aware of the services the consulate has to offer them. 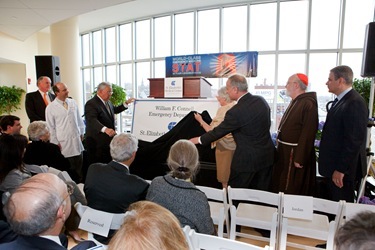 I went to St. Elizabeth’s Medical Center for the inauguration of the new Emergency Room later that afternoon. 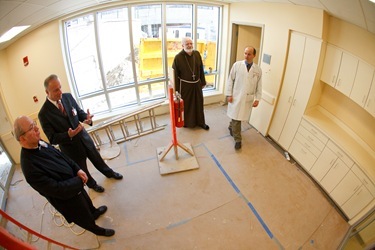 Though I didn’t have a chance to see much of it before the ceremony, Dr. Mark Pearlmutter, the head of emergency medicine at St. Elizabeth’s, and John Holiver, the hospital’s president, were kind enough to give me a full tour as the project was nearing completion. 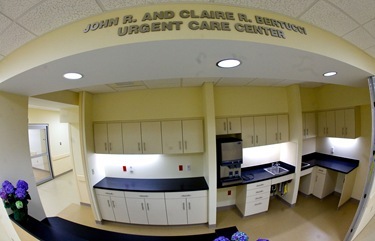 The facility is modern, truly state of the art and very, very spacious. 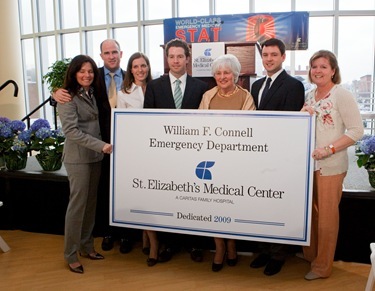 We’re very grateful that Margot Connell was there with her family. 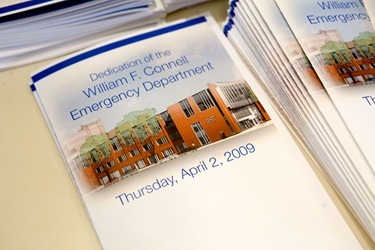 The new emergency facility is named for her late husband, William Connell. 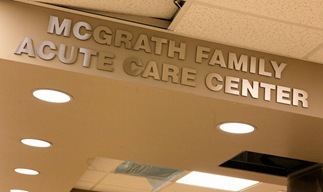 Also, various areas of the new facility are named after the McGraths, the Bertuccis and the friends of Dr. Ken McDonnell — there were so many very generous benefactors whose contributions made this emergency room possible. 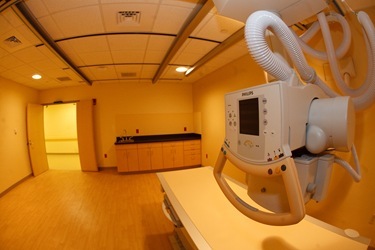 They are installing a new CT scan machine — the only emergency room in the area to have one — that can do a brain scan or a heart scan in seconds. It allows them the ability to begin the correct procedures and medication depending on what they discover. 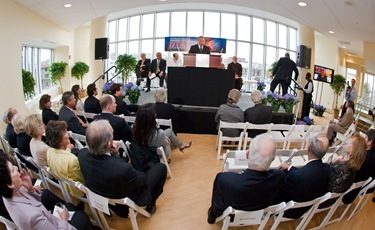 I remember that at the dedication ceremony they said the new machine is so fast that it will take longer to wheel a patient into the room than to perform the scan! That evening I went to the Boston College Law School where Gabriela Shalev, the Israeli Ambassador to the United Nations, was giving a conference. Afterward, we had a reception followed by a dinner and press conference that I took part in. Ambassador Shalev was here to talk about her work in the United Nations and the situation in Israel. She said that the Israeli people are looking forward to the visit of the Holy Father and envision it as being an important moment in their history. She was frank in talking about some of the difficulties that Israel is facing. During the evening I met several members of the Jewish community who had also been at the rededication of our Holocaust Memorial Menorah two weeks ago. They expressed their great delight at the outcome of that ceremony. Many members of the Jewish community who have studied at Boston College also said how welcoming the Jesuit college was to them. On Saturday, I went to the North End for the Eucharistic Congress, where I met with Mother Assumpta Long, OP. 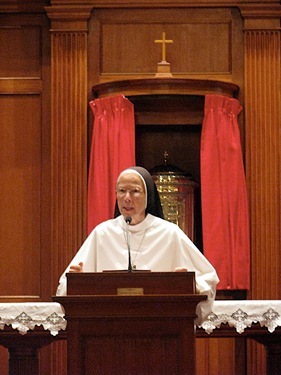 She is the Prioress General and one of four founding members of the Dominican Sisters of Mary, a community of sisters whose mission is in education. 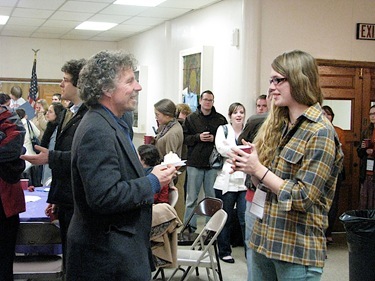 She gave a stirring talk on Friday night at the Eucharistic Congress. 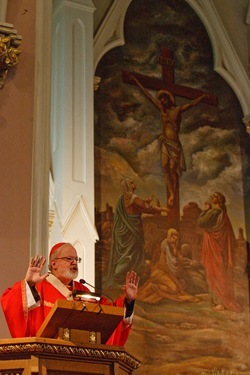 On the second day of the congress, I celebrated the Mass at St. Stephen’s. It was the Vigil Mass of Palm Sunday with the reading of the Passion. 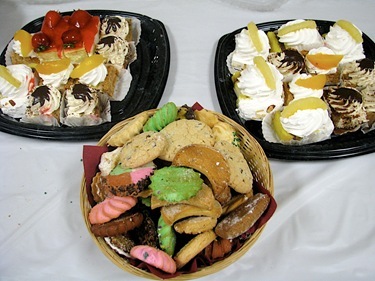 Afterwards, the restaurants and merchants of the North End provided food for the young people which was served in two auditoriums at St. Leonard’s, which is just across the way from St. Stephen’s. 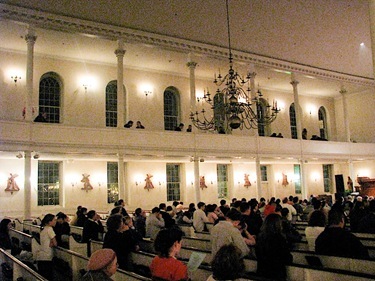 Then there was a talk at 8:30 followed by a Holy Hour. 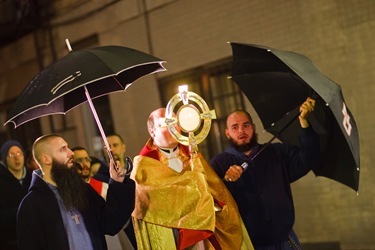 At 10:00 Saturday night, we had a Eucharistic procession through the streets of the North End. We went from St. Stephen’s to St. Leonard’s. When we arrived at St. Leonard’s we had the prayers and the benediction. 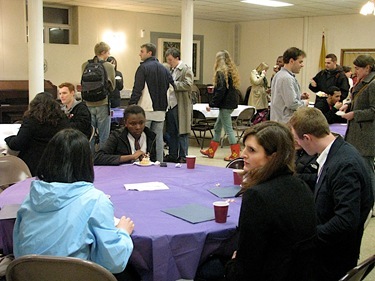 This is the second year we have done this and it was very well attended — it was standing room only at the church, mostly young adults and college students. 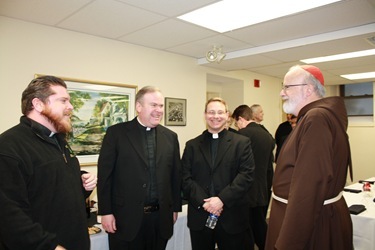 The heads of the three offices who worked together to make this happen were Father Matt Williams from the Office of New Evangelization, Father Richard Clancy from Campus Ministry, and Fathers Dan Hennessey and Michael Harrington from the Vocations Office. On Sunday I went to St. John the Baptist Parish in Peabody. I visited their new St. Vincent de Paul food pantry. St. John the Baptist also has a very strong ARISE program — both for the English-speaking community and the Spanish-speaking community. Father Carlos Gomez, from Colombia, helps the pastor, Father John Maclnnis, with the Hispanic community. There’s also a Hispanic deacon, Deacon Valentin Rivera, who helps quite a bit. 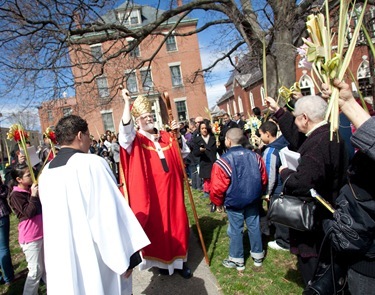 Then we blessed the Palms in St. Mary’s Park followed by a procession to the church where we celebrated the Mass in Spanish for the Hispanic community. 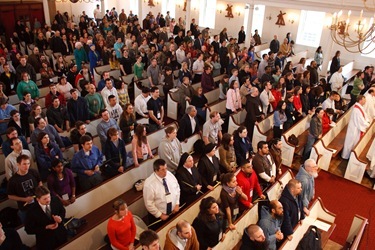 It was very well attended — the church was packed. At the offertory they put a basket up for the children to come up and scores of children came to give their little donation. The very last one was a little three-year-old girl who sort of waddled up. She got right up to the basket with her dollar bill and then she reconsidered. Her mother had to come to get her to give up her dollar. It made me think of that Whoopi Goldberg movie where she was supposed to give a donation to the convent and she couldn’t let go of the check! It was heartening to see that all the different nationalities have melded together into a faith community. 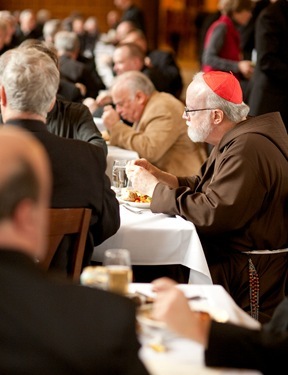 On Monday, I celebrated Mass for the St. Thomas More Society at Boston College Law School. It was founded at BC Law, but they have invited law students from other universities to join. Afterwards we had a dinner hosted by Dean John Garvey and the law school. I gave a talk at dinner and then we had a question and answer session. 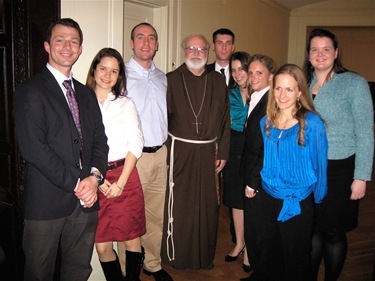 It was a very impressive group — maybe 60 law students — and all very committed to their faith. 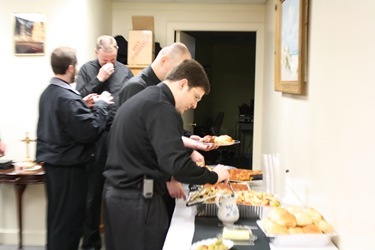 On Tuesday, we had the Chrism Mass and luncheon. 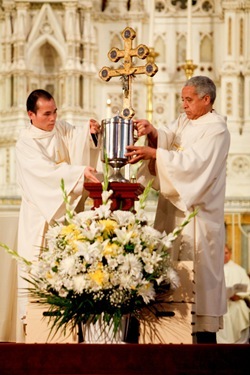 At the Chrism Mass we bless the oils that will be used for the sacraments throughout the year: baptisms, anointing of the sick, confirmations, ordinations, etc. 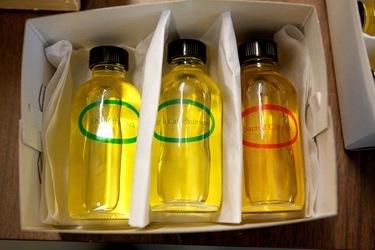 The oils are distributed to the priests, or another representative of the parish, after the Mass. 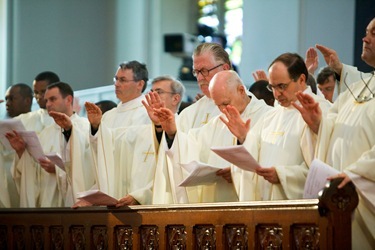 During the Chrism Mass, priests and bishops also renew their ordination vows, so as many priests and bishops as possible try to attend. 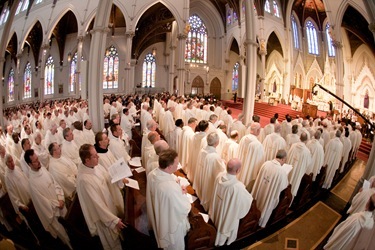 Because of this, the Chrism Mass has always been seen a day for priests to come together with their brothers to confirm their commitment to their priesthood. In Boston, to allow this time of fraternity to continue beyond the Mass itself, we hold the Chrism Mass Luncheon at St. John’s Seminary. 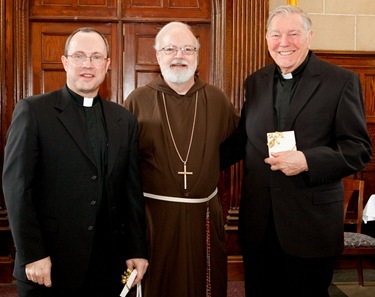 At the luncheon we honor two priests, selected by their peers, with the St. John Vianney Award for their excellent service to the people of God. 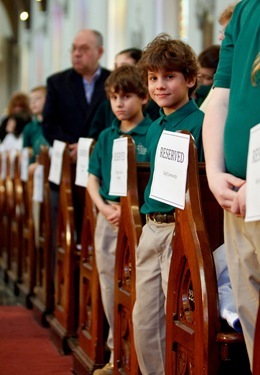 This year, we honored Fathers Stephen Salocks and Joseph Smyth. It’s always a wonderful celebration. In my homily I told the priests that now, more than ever, we need to be missionaries — sometimes even in our own backyard. 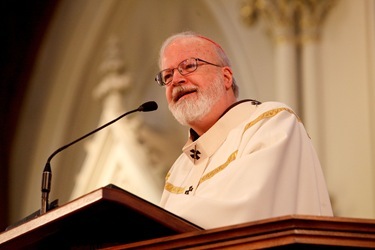 I thank you for your presence here today on behalf of the two million Catholics who depend on your ministry and are nourished by your labors and good example. 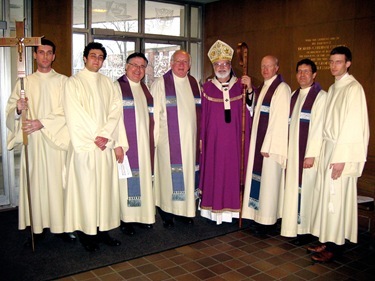 I thank you for saying yes to the call of a priestly vocation. We call you Father because you are spiritual Fathers to God’s people. May your example and encouragement inspire many young men to follow in the same path. 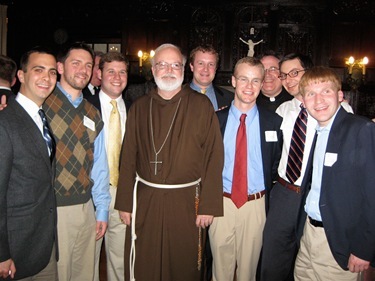 Know that nothing is more powerful than the invitation of a priest, asking a young man to consider a priestly vocation. 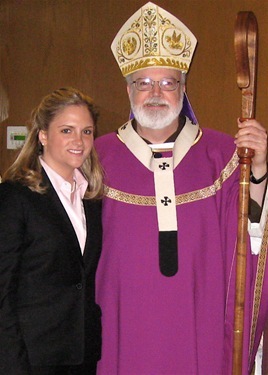 When I was in the seminary, our Provincial, Fr. Victor, wrote a letter to Rome in which he said that our mission in Puerto Rico was flourishing and that our Province was prepared to take on a second mission. He said that he wanted the most difficult mission in the world. The response was lightening quick saying that we should open a mission in the Highlands of Papua New Guinea. The guardian, Fr. Fermin Schmidt, from the Capuchin College in Washington was named the first Bishop and friars were sent. Three of my classmates went. It was reported back to us that when the friars landed in a field, the natives who had never seen Europeans or an airplane were quite curious. They asked if the plane was a male or a female. They said if it was a female they wanted an egg. I was particularly intrigued because one of my own pastors had just told me that his parishioners were not ready for a parish council. To do this we must realize that our own country is a mission land where we are to be the missionaries. Who knows if our Provincial, Father Victor had written today asking for the most difficult mission in the world, he might have been directed to these shores. For secularism there are no absolutes, there is no forever. We wake up orphans, we are contingent, transient and on our own. Pope Benedict wrote recently that: “The real problem of this moment of our history is that God is disappearing from the human horizon and with a dimming of the light which comes from God, humanity is losing its bearings, with increasingly evident destructive effects” (letter to Bishops of March 2009). But the hunger for God is deep in our hearts and although other hungers and desires can mask the most basic hunger of all, the longing for God is the most profound human sentiment, a homing device in the center of the human heart. In June of 1979, Pope John Paul II arrived in Poland. On the Vigil of Pentecost he addressed the Polish people in Blonie Field near Krakow, he called on them to be witnesses of Christ’s Cross and of his Resurrection (witnesses of the Resurrection – was part of the job description for the Apostles). Millions of Polish people, men, women and children thundered back: “We want God!” What a moment in modern history. From the mouths of people in a modern atheistic dictatorship. The cry was heard around the world. “We want God,” was like the trumpet blast that caused the Walls of Jericho to fall. Christ is not the past. He is the future, the Pope declared and the masses thundered their response: “We want God.” If there is anything to be learned from the present crisis it is that the Golden Calf cannot save us. We need God, and we need each other. It was the same plaintive cry that haunted St. Patrick’s dreams beckoning him to return to the land where he has suffered so much. People’s hunger for God pervades. We must boldly invite them to the wedding feast. The most unlikely ones will come. 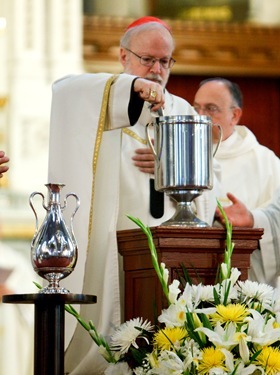 The Chrism Mass’s first lesson and Gospel recall Jesus’ inaugural sermon that sets the themes of His ministry. Jesus proclaims in Nazareth and before the world that he was sent. Anointed and sent. To be “sent by the Father” pertains to the essence of Jesus’ identity. In the same way, Jesus makes Himself present in those He sends: “Amen, Amen I say to you, whoever receives the one I send receives me, and whoever receives me receives the one who sent me.” (John 13:20). We talk so much about priestly identity. Let us not forget this missionary aspect of our priestly identity: we are sent to proclaim the Good News to the poor, and especially those who are impoverished by being far from the Gospel and the community of faith. The missionary urgency of the present time in our Church demands a renewal of pastoral practice and bold strategies that addresses the new challenges of our Church today. We need a new apologetic to respond to the questions that contemporary people have. Our catechetical efforts must be about mentoring people in the faith in a worshiping community. 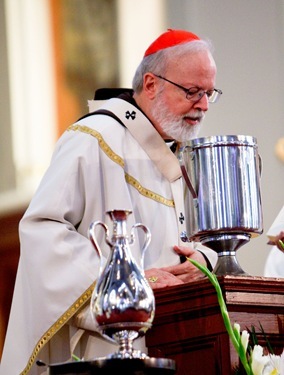 We need to instill in our people a sense of vocation, a generous response to God’s call to serve and to sacrifice in a particular way of life, especially married life, family life and the priesthood. Our task is to introduce Christ to the multitudes that do not yet know that He is alive and He loves them and He acts through His Body, the Church. Our patron in the Archdiocese of Boston is St. Patrick, one of the greatest missionaries in the history of our Church. Ireland was not a real nation state. It was a series of fiefdoms and many kings and cantankerous chieftains. There were countless clans whose main pastime was fighting among themselves, and thoroughly enjoying it. (At least the O’Malleys did). Unlike many other places in Ireland there were no forced conversions, no carrying the cross and the sword together. No Constantinian state religion or cujus regio euis religio. Rather there was an escaped slave, a foreigner, who returned with a band of monks and converted a whole country, by example, persuasion and grace. The most amazing thing about Patrick is that he transformed the country by turning the Irish into evangelizers. The Irish evangelized, not just in Ireland, but in England, Scandinavia, Germany, Switzerland, Italy. Some even claim that Irish monks arrived in the New World before Columbus. It is possible. The Irish were on the move, a people with a message and a mission. It is estimated that at one point in the middle age, one tenth of the population was involved in some sort of direct evangelization. The Irish were the original Jehova Witnesses. They were tireless in their efforts to make the Lord known and loved. Patrick was a great missionary because he turned the people into missionaries. In the Gospel, Jesus says that the Good Shepherd leaves the 99 sheep behind to go looking for the one lost sheep. That is truly bold, but it is what Jesus asks of us. Unfortunately, I think we often do the exact opposite. We stay guarding the one sheep, while 99 drift away into oblivion. The Church does not exist of or for herself. The Church is the extension in time and space of the presence of Christ and His saving mission. Today’s Gospel shows us Christ sent by the Father and anointed by the Holy Spirit. Today Christ is counting on us His disciples to continue that mission. The phrase that echoes from Novo Millennio Ineunte is: “Duc in altum” – Cast out into the deep. The powerful video “Fishers of Men” reminds us of the missionary nature of our priesthood. Fishermen seek out the fish. In three of my four Paradise-on-earth dioceses, where I have been privileged to serve as Bishop, fishing is an important industry, and even in Palm Beach it was a serious sport. Serious fishermen pursue the fish and seek to entice them into nets and onto their lines. It is no wonder fishing is rated the most dangerous job in our country by the U.S. Labor Department. Fishermen routinely take great risks and face many dangers and hardships in their work. It is a wonderful metaphor for our priestly ministry. It is difficult and demands sacrifice to be fishers of men. In our life, there are contemplative moments of preparing our nets in prayer and priestly fraternity, and then there is the toil of casting out into the deep and bringing the fish home. 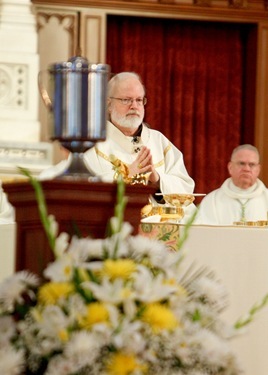 Paulist Father Robert Rivers has written a provocative volume called, From Maintenance to Mission: Evangelization and the Revitalization of the Parish. 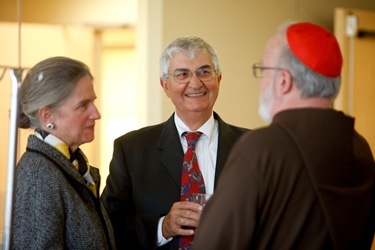 His premise is that evangelization has the power to bring new unity to the Church in this period of upheaval, and can lead to an experience of reorientation within the Church and a renewed impact on the society in which we live in this new millennium. Evangelization challenges all baptized Catholics to a conversion to Christ, by living their faith fully, inviting others to faith, and living these Gospel values in the world. 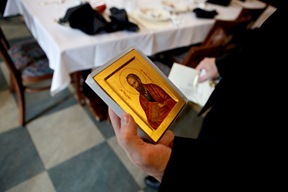 It gives us a new lens through which we can view our Catholic faith. That lens is threefold: spiritual renewal, missionary activity, and action for justice in the world. Too many parishes are maintenance oriented because their parishioners often have a consumer culture mentality. They come to Church to get something and they expect the leadership to provide it. 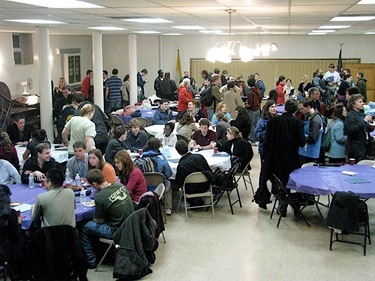 All the energy and resources of the parish are oriented to serving the people who are present, rather than reaching out to those who are absent. We must work to help our parishioners to move beyond being consumers to being disciples who share actively in the mission and ministry of Jesus. We are called to evangelize out of love of Jesus Christ and of the people who will be graced by what His Kingdom of love, peace and justice will bring to their lives. If a doctor had discovered a cure for cancer or for AIDS and refused to share that with people beyond his circle of family and friends, we would consider that criminal. Not sharing the power of the Gospel and the Sacraments with our neighbors is also criminal. The operative parable is the story of the man who buried the shining gold talent in the ground. This was condemned as an act of cowardice and selfishness. 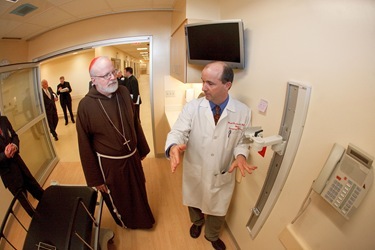 Our Catholic people are so generous in fulfilling the corporeal works of mercy. 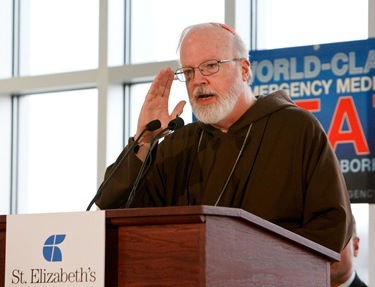 The Catholics of Boston respond in an incredible way in supporting the missions or coming to the rescue of the victims of natural disasters. 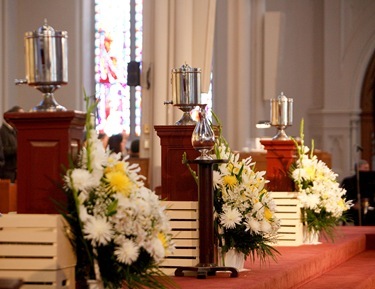 When I was in the islands and our diocese was devastated, it was the Catholics of Boston who responded first with a helping hand: both with money and then by sending a priest, Fr. 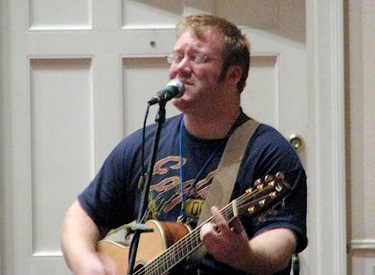 Brian Keily. Our Catholic people must come to see that people’s spiritual hunger, and starvation must be the object of our mercy, our concern and our outreach. The first way to do that is to be welcoming and gracious communities. Often, people who have been away from Church, approach with fear and trembling. We must put them at ease. 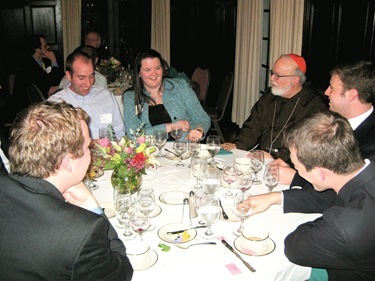 Andrew Greeley who has not had an unpublished thought even the bad ones mused recently: “I wonder often whether parish staff members and priests ought to have a course from the people who administer the Four Seasons Hotel chain on how to be friendly and attractive to the people they welcome to the Sacraments. As it is now, it often seems as if they have been trained by the U.S. Postal Service” (p. 172). 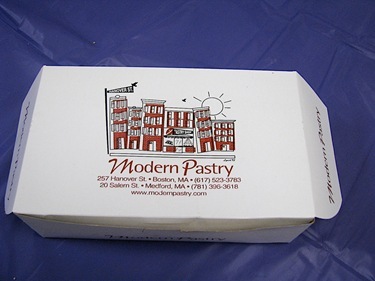 I am sure the Boston Postal Service is friendlier than Chicago’s, but the point is well taken. 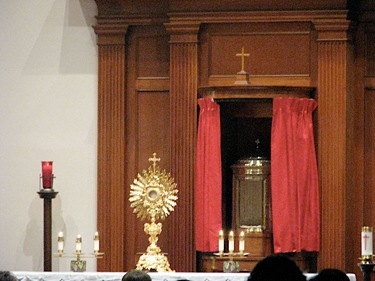 Beautiful liturgies, good preaching, and effective sacramental preparation programs are so important. As a pastor, I am ashamed to say, I did not have an RCIA program because I thought that all the Spanish and Portuguese-speaking were baptized. Those of you who come to the rite of election here at the Cathedral cannot help to be impressed by Fr. 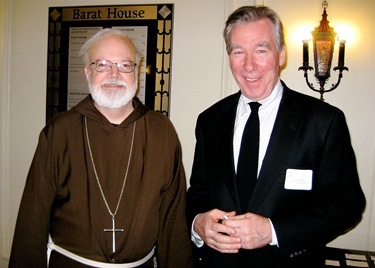 Paul O’Brien and Fr. Jorge Reyes whose parishes each send fifty or sixty new Catholics every year. In the new millennium, business as usual is not enough. Priests of the future cannot be the lone ranger, and they cannot be the Maytag repairman. We must be a team of missionaries, moving from maintenance mode to a missionary one. 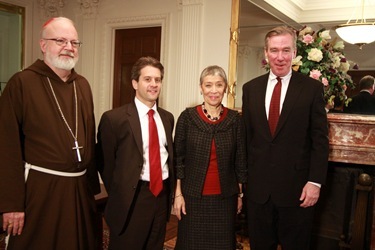 Last month, I was privileged to be with the Holy Father when he declared the “Year of the Priest” to mark the 150th Anniversary of the Curé of Ars. Never did we need this more than now. I hope that this time of prayer, reflection and planning will help us all to be renewed in our priestly ministry and launch us as priests with a missionary heart of the Good Shepherd. 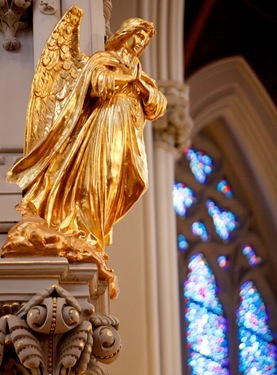 The Curé of Ars once said to a fawning visitor: “The Queen of Sheba expected too little, but you, Madame, expected too much.” Sometimes, we are the same, we don’t expect enough of Christ, and we rely too much on ourselves. The Curé of Ars was sent to that backwater parish in a town with one tavern for every ten houses (sounds like South Boston), for one reason: the pastor there was the only one willing to accept such a lackluster curate. Yet, the Curé of Ars was a great priest because he was in love with Christ, with his priesthood and with the people he was sent to serve. Someone once wrote to a famous Rabbi, the Lubavitcher Rabbi, saying: “I would like the Rabbi’s help, I wake up each day sad and apprehensive. I can’t concentrate. I find it hard. I keep the commandments, but I find no spiritual satisfaction. I go to the synagogue, but I feel alone. I begin to wonder what life is all about. I need your help.” And the Rabbi sent the letter back underlining the first word of each sentence. And it was always the same one, “I.” This is the unhappiness of the lonely modern autonomous self. We must learn to say we and to be we. There is a Zulu proverb: “I am because we are.” We are not alone, we are Christ’s Body, and we are His presbyterate, His missionaries, anointed and sent to share the good news of God’s love with the poor and with everyone God puts in our path. May this year of the Priest be a time for us to repair our nets together so that we might better carry out the mission the Lord has given us. Pope John Paul II says in Redemptoris Missio: “Faith is strengthened when it is given to others.” A missionary spirit can unite and energize our Church. Christ is the missionary of the Father, and we are his missionaries: fishers of men, not keepers of the aquarium. May Mary the Mother of the Good Shepherd help us to be priests after her Son’s own Heart. 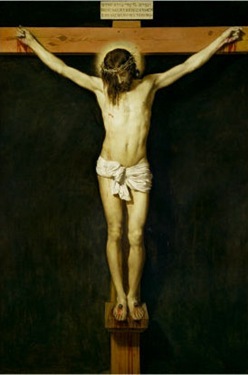 As we prepare to celebrate the Triduum, that will culminate with the Easter Vigil in which we will celebrate the resurrection of our Lord, I want to leave you with this beautiful painting of the crucifixion by Spanish painter Diego Velazquez as well as an anonymous poem in Spanish that I learned by heart many years ago. muevenme tus afrentas y tu muerte. And as ray love is now, it should remain. I wish you a happy and blessed Easter!